Taco Bell Crispitots are a favorite around my house. 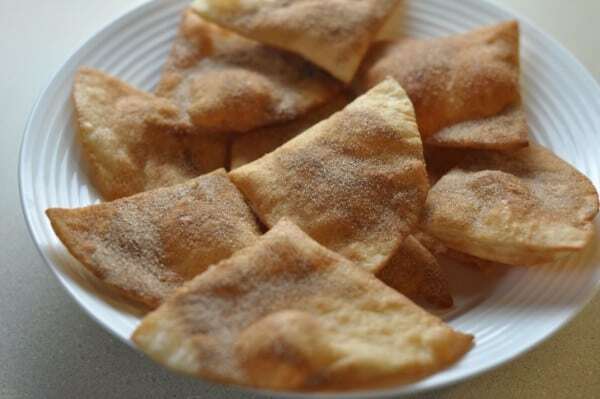 These are also known buenelos in many Mexican restaurants, Taco Bell Crispitos are a delicous dessert. All you need is some flour tortilla a little cinnamon and some sugar to make Taco Bell Crispitos. You can prepare Taco Bell Crispitos dessert in no time. I love to serve this with ice cream. Make this easy to prepare copycat Taco Bell Crispitos for dessert. Mix together cinnamon and sugar very well. In a Dutch oven, or large skillet heat the oil to 350 degrees. If you do not have a thermometer, you can set it on medium high, but be careful to watch that it doesn't get too hot and begin to smoke. Quarter the tortillas and deep fry 2-4 at a time. Allow them to cook on one side for about 30 seconds or until golden brown, turn over, and repeat. When both sides are brown take out, and place on paper towels to drain. While the tortillas are draining liberally sprinkle with cinnamon and sugar mixture. These are really great with honey. These make the perfect snack! And there so easy to make!